There are multiple way’s of configuring High Availablity on a set of Cisco ASA firewalls. 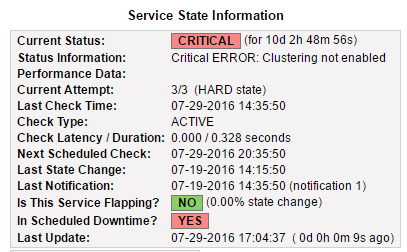 As of now there is no way to monitor the cluster status using SNMP, the only way to check if your ASA cluster is up and running is by monitoring your interface status. If the data interfaces of a single ASA change to a disconnected state you know something has gone wrong in your cluster. However I wanted more, after contacting TAC they confirmed that there still is no way of monitoring the ASA cluster with SNMP so I had to find a different way. 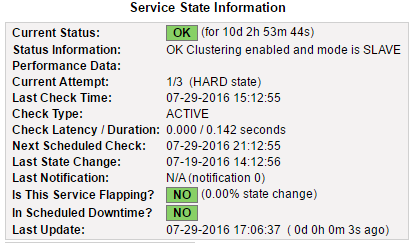 Most I wanted is shown when you run the ‘show cluster info’ command from the system context (if you use contexts), so to monitor the ASA cluster status with Nagios all I needed was a output from this command. For this I created two simple scripts (one in batch, the other in expect) to login with SSH and run the show cluster info command. Now this is absolutely not the best way of monitoring, and as you need to provide the password somewhere in Nagios it is not the most secure way but it works and especially in a development environment it is a good way of knowing when something has gone wrong in the ASA cluster. 3) Edit nagios templates.cfg and add a new service, in my case I check only every 6 hours, no need to bash the ASA with ssh logins as long as we get a notification if something goes wrong once a day, so edit your templates.cfg and add the following section at the bottom. The mode is a 0 if the monitored unit should be the cluster Master and a 1 if the unit should be a cluster slave, this way you can check if your cluster master status changes to another unit. 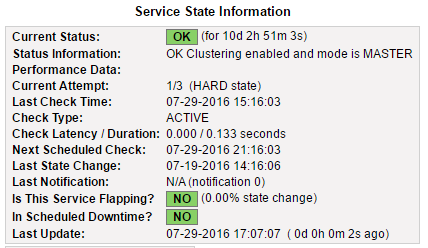 Hopefully Cisco will add support for ASA Clustering status monitoring in SNMP sometime soon so we won’t need workarounds anymore.